At a surface level, it doesn't seem too difficult to figure out what happened in trading Tuesday. All the good had been priced in last week, as headlines had made the rounds stating that China had made sizable concessions on trade in an effort to get the ball rolling with President Trump. By the time traders had reached Tuesday morning, the positive vibes generated the week before had grown stale, while the public digested both broadly disappointing IMF projections regarding global economic growth and a slate of 2018 Chinese data-points that seemed to confirm such sentiment. In addition, not only had the major domestic equity indices reacted in late December to a severely oversold condition, they had all of the sudden found themselves in the eerily peculiar position of being overbought. Hmm. Should Friday's highs remain the highs for a bit, all we are left with is a still-unbroken series of lower highs that co-exist with the potential for lower lows as well. There were two catalysts that forced broad algorithmic response on Tuesday afternoon. First, the Financial Times ran a story that the Trump administration had cancelled talks to be held at the vice-ministerial level between the U.S. and China this week due to a lack of progress on such key issues as "forced technology transfers." On that news, equities traded to their lows. Out came the president's economic adviser, Larry Kudlow, who denied that there had been any cancellation because there had never been a planned meeting. Kudlow made clear that the higher-level meeting later this month, that would involve China's Vice Premier Liu He as well as U.S. Treasury Secretary Steven Mnuchin, was still planned. Clearly, while growth remains the medium-to-long-term issue, for the short term, monetary policy has been removed as a market restraint and keywords related to trade will guide near-term pricing. S&P futures do appear to have found some footing Wednesday morning, in response to both Kudlow and a statement made in Davos by former UK Chancellor of the Exchequer (U.S. equivalent would be the Secretary of the Treasury, but the Chancellor actually carries more responsibility over budgetary concerns) George Osborne, that he felt that Britain's exit from the EU would be delayed past the March 29 deadline. 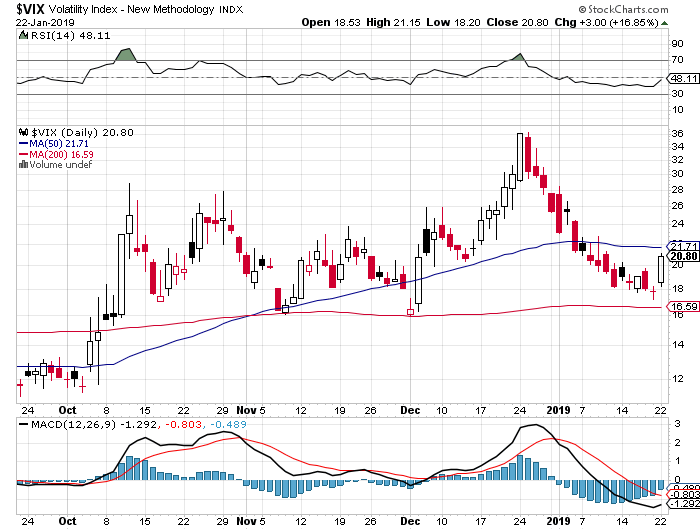 It would seem to me that the Volatility Index came very close to forming a triple bottom on Tuesday, supported by the 200-day simple moving average. Staying tuned for another headline-driven attempt would be prudent. Now, what are the chances that markets hold their overnight levels? First off, on monetary policy, the negative impact forced on GDP by the length of the partial government shutdown is now more than just a blip on the radar. Now, it's a dent. Later Wednesday, when the Senate most likely fails to pass a motion to re-open the government, key readers will react to that outcome. What momentum players do then will largely rely upon statements made by leading politicians to the media and how far apart they portray the two sides when they go about blaming each other. What this does, in addition to the awful print for December Existing Homes Sales that hit the tape on Tuesday, is reinforce the idea that the Fed must remain on the sidelines (at least as far as the Fed Funds Rate is concerned, quantitative tightening is still humming along at maximum speed) for now. 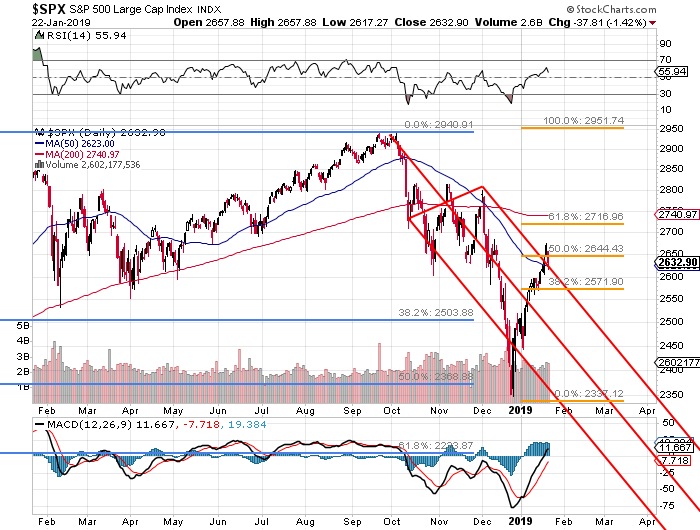 That may be enough for the S&P 500 to further exhibit possible support at the 50-day SMA, a level that was briefly pierced to the downside on Tuesday afternoon. This morning, the 2644 level, a level that was so crucial to trade last week, will re-emerge in significance as the day wears on. We must see successful defense of that spot to confirm that the downward-sloping Pitchfork model has been broken. Given the algorithmic overshoot regularly experienced in these times, I do not feel that we have this confirmation as of yet. From the Wall Street Journal Opinion page on Monday night came a short piece written by Rich Danker, a former senior adviser at the U.S. Treasury Department. Danker has an "outside the box" idea on how to tackle China's dominant position as a global exporter, as well as returning decent-paying middle class jobs to this country. All it requires is making the U.S. dollar less desirable... which could mean surrendering the elite status of the U.S. dollar as the reserve currency to planet earth. Crazy idea? The U.S. benefits way too much from being able to maintain the ability to export inflation? Perhaps. Danker's ideas includes repealing the tax exemption on income from U.S. Treasury debt products as a way to drive down dollar-denominated demand. Danker also thinks that the Treasury and the Federal Reserve could make it more difficult for foreign accounts to acquire and deposit assets in dollar terms. I do not necessarily see this as a good idea. Yes, this would certainly reduce demand in dollar terms, but also likely increase borrowing costs at the federal level at a time when borrowing is growing rapidly. Then there's the likely negative impact on consumer credit that would occur in the hope that a spate of middle to upper middle class jobs are created. I am not panning this idea either. Someone is being creative in a space where such creativity is desperately needed. The piece is worthy of the time required to read it. Or you could just watch something moronic on television and let your brain rot. The first thought that ran through my head when I saw IBM's (IBM) stock move was disbelief. I had bet on Ginny Rometty a ways back. Like so many others, since then I had given up on Rometty. I had lost some money on that long, but at least I had taken my leave before the real pain had set in. Then there was the absurdly expensive (just my opinion) Red Hat (RHT) deal that seemed to force the share price of IBM into the abyss. You know what they say... If you can't grow organically, then you have to go out and buy growth... even if it means overspending. On Tuesday evening, IBM reported a double beat for the fourth quarter. Non-GAAP EPS beat by a nickel, while revenue of $21.76 billion actually printed about $30 million north of consensus. That number should also be noted as a -3.5% decline year over year for the quarter, just saying. What is now interesting about IBM is not that there's nothing to dislike in last night's numbers, it's that finally there is quantifiable proof that something significantly positive might be happening. The share price, now well off of it's late-December lows, does seem to support this. Some business lines contracted, some grew. I will not bore you wit the nitty gritty. What IBM has been focusing on is a space that the firm refers to as their "Strategic Initiatives." Components of that focus would be such business lines as cloud computing, mobile technology, data analytics, social media and cyber security. For the full year 2018, IBM (the entire firm) reported revenue of $79.6 billion. That number represents pedestrian growth of 1%, but growth nonetheless -- something IBM had become unaccustomed to. As a whole, Strategic Initiatives delivered revenue of $39.8 billion, up 9% year over year. Broken out from the group, cloud computing delivered $19.2 billion (+12% y/y). By itself, cloud computing comprised 24.1% of the entire firm's revenue for 2018, while the Strategic Initiative group in aggregate delivered more than half. The Red Hat acquisition, expected to close later this year, should enhance this effort, despite its expense. Does that vault IBM toward the next level, so that it might legitimately compete against the likes of Amazon (AMZN) , and Microsoft (MSFT) in the space? We shall see. Fundamentally, margins did grow in the right places. There was significant margin contraction in the Systems grouping, but that is understood to be a business in decline and is no longer the focus. Cash levels are now lower (at $11.3 billion) than they were a quarter ago, or even a year ago, while total debt levels remained more or less stable. It might be notable that a sizable portion of that debt over the course of the past year had been moved from the long-term column to the short-term column. Remember, IBM agreed to pay $34 billion (or roughly 3x what they have in hand) in cash for RHT, so getting the balance sheet into a manageable condition is paramount. Oh, IBM still does pay that handsome annual dividend of $6.28, or 5.13%. That is not too shabby at all. Personally, I will not be chasing IBM this morning. In the zero-dark hours of Wednesday morning, it appears that the stock could open at, or above the 38.2% retracement level of the RHT-inspired autumn selloff at $130. My instinct tells me that a better price becomes available either later in the day, or later in the week for investors that might be truly interested. The dividend that knocks more than $6 off of net basis per year would be, for me, the most attractive item here. 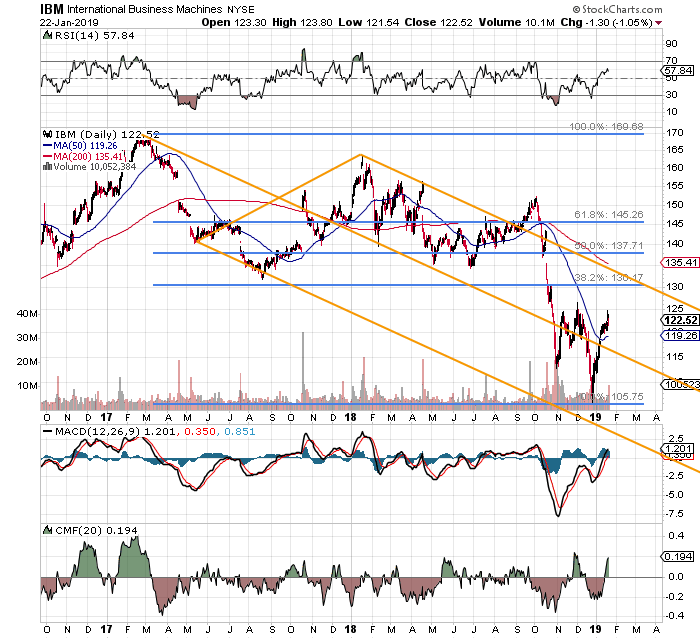 I do believe that the RHT acquisition will hurt IBM in the short term post-deal. I don't believe that IBM will effectively compete against Amazon, Microsoft, or even Alphabet (GOOGL) in the business cloud. I could be wrong. That's what makes a market. And that said, I would be open to an entry-level position at a minority level of overall exposure in order to maintain a broader strategy focused upon cloud computing. This is definite progress being made. 08:55 - Redbook (Weekly): Last 6.7% y/y. 09:00 - FHFA House Price Index (Nov): Expecting 0.2% m/m, Last 0.3% m/m. 10:00 - Richmond Fed Manufacturing Index (January): Expecting -5, Last -8. 16:30 - API Oil Inventories (Weekly): Last -560K. At the time of publication, Guilfoyle was long AMZN and MSFT.